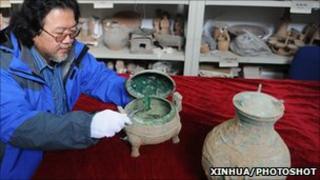 Chinese archaeologists have unearthed what they believe is a 2,400-year-old pot of soup, state media report. The liquid and bones were in a sealed bronze cooking vessel dug up near the ancient capital of Xian - home to the country's famed terracotta warriors. Tests are being carried out to identify the ingredients. An odourless liquid, believed to be wine, was also found. The pots were discovered in a tomb being excavated to make way for an extension to the local airport. "It's the first discovery of bone soup in Chinese archaeological history," the newspaper quoted Liu Daiyun of the Shaanxi Provincial Institute of Archaeology as saying. "The discovery will play an important role in studying the eating habits and culture of the Warring States Period (475-221BC)." The scientists said the tomb could have held the body of either a member of the land-owning class or a low-ranking military officer, the report said. Xian served as China's capital for more than 1,100 years. In 1974, the terracotta army was found there at the burial site of Qin Shihuang, China's first emperor. He presided over the unification of China in 221BC and ruled until 210BC.